The Australian Communications and Media Authority is seeking public comment on a proposal to make FM frequency 99.9 MHz available at Mossman, 20 kms north of Port Douglas for a new long-term community radio broadcasting services. Port Douglas is currently served by 107.1 FM, simulcasting on 90.9. It has been broadcasting since 1999. The ACMA believes that the current temporary community broadcasting licensees in these areas have generated sufficient interest to consider providing long-term community radio broadcasting services, however, before making a final decision, they are looking for feedback from the community. The proposed changes are contained in draft variations to the Cairns radio licence area plan. You need to contact the ACMA by next Friday 29th October, tel 1300 850 115. There is a view that if a new long-term community radio broadcasting licence is made available for Mossman, it is likely that they would be taken up. The licence for Smithfield High School's Coast FM 101.9 fm is also up for grabs. The temporary licence has been held by the school for 10 years, and now the ACMA want it to be upgraded to a permanent. ACMA have called for applications for the community radio licence currently allocated to 101.9 Coast FM. Smithfield High School principal Barry Courtney, is optimistic that they will retain the licence. "We need to reapply to keep the licence and also it may be given to another party," Barry Courtney said. "Much work has been done this year to try and position Coast FM for a future with Smithfield High and this process allows us to pursue this agenda." He says the purpose of Coast FM and its relationship to Smithfield High still needs work. "The school exists to provide learning opportunities for students, and the relationship therefore must have a significant learning outcome for students," Barry Courtney says. "The school does have a community responsibility and the radio station is a unique opportunity to develop this. So the defining of this relationship is crucial." Smithfield State School has attempted to run the whole radio organisation and he is now seeking support from the community so that it is sustainable. Meanwhile the woes at Cairns Community radio continue. The ACMA is soon to rule on a number of more breaches to their radio licence. Since September last year, over 20 complaints have been lodged, and 4CCR has received five formal investigations and numerous breaches, including a set of Agreed Measures handed down. With just over a month to submit a final report, and with $163,000 unexplained in the Association's accounts, despite numerous requests to station president Rodney Coutts from members, he is now believed to have fluttered away for a week's holiday at the Community Broadcasters conference in Hobart. I'm not surprised, but it's only a matter of time before the money dries up. In less than 12 months, Coutts turned a $64,800 profit in 2009 into a $95,400 loss. He deserves a good holiday. 4CCR is still operating without a secretary, a legal requirement, following a sham AGM in September, and the committee has still not been updated on the website. 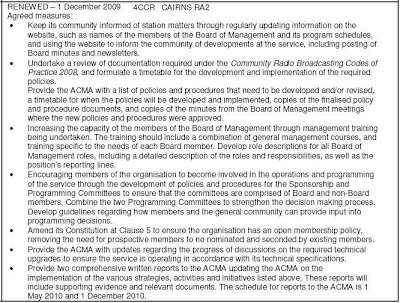 Meanwhile, the ACMA has accepted an enforceable undertaking from Perth community radio where it found they had breached licence conditions requiring it to encourage community participation and the selection and provision of programs, some of the same breaches as in Cairns. However, there are some good stories in community radio, although they seem few and far between. Both Townsville and Darwin run great stations. Wollongong's Voxfm has be recognised for turning the station around from the brink of collapse, vindicating a principled stand by the Friends of VOXfm in it's fight for survival. Like Cairns Community Radio, VOXfm has been plagued by infighting and financial problems, and a lack of transparency in how the station was run. A new president has changed the culture of the organisation and new members were signing up every week. "I did it with the help of the board and volunteers, though. I certainly couldn't do it by myself," Ms Collins said. If only Rod Coutts could listen and learn.